Ever been curious about how water gets to your tap? Ever wonder what happens after you flush the toilet? Join us for our series of semi-regular posts in which to try to demystify the process. This is our fourth in the series. In our last post, we talked about the screening process — how we get (most) of the things that don’t belong out of the wastewater before it goes on to treatment. Now we’re going to explain what happens next. 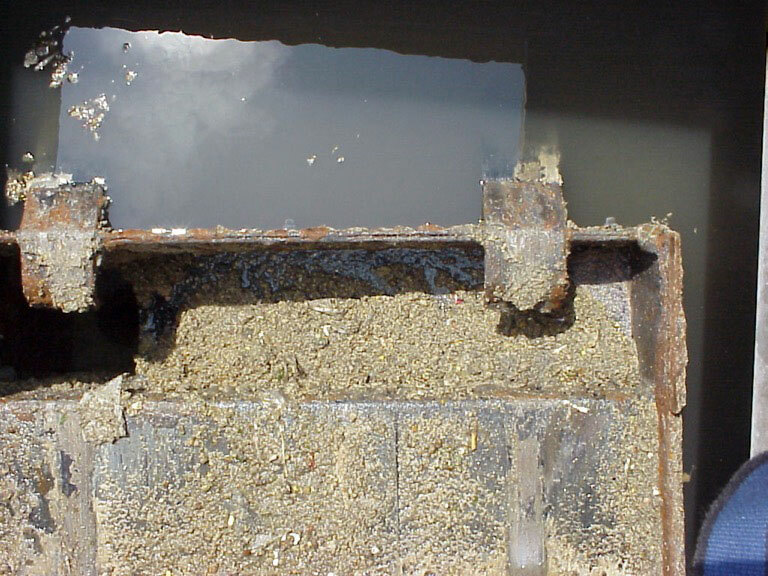 After the wastewater is screened, it’s pumped into the Aerated Grit Chambers to remove inorganic debris such as sand and stone. Then it’s directed into four circular, center-feed, Primary Settling Tanks (PSTs) — seen in the picture at the top of the page. Each tank is 120 feet in diameter and can hold 1 million gallons. The bottoms are cone-shaped; the deepest areas of the tanks are 16.3’. The PSTs were constructed in 1978. In 1990, we covered them with aluminum geodesic domes and constructed a scrubber system, which is designed to control odors. 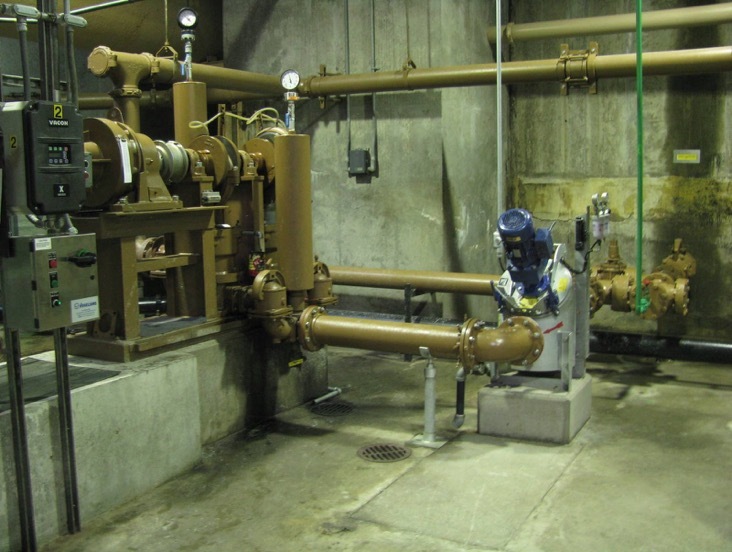 In 2004, we replaced the aging sludge collector mechanisms to keep them up-to-date. The primary treatment process is designed for a continuous flow of wastewater. Here, it’s slowed down a bit, though. During this portion of the process, each molecule of water spends about 2.4 hours in a tank. This is enough time to allow heavier particles, or particles of greater density, to settle before the water moves on. The system is designed to handle on average 40 million gallons of wastewater a day; however, during severe storms up to 87 million gallons per day has flowed through the tanks. The solids, now sufficiently concentrated, are referred to as “sludge.” At this point, the sludge consists of solid human waste, toilet paper, and food scraps. The scum of oil, grease, fats and debris collected from the tops of the tanks is mixed in with the sludge, too, and it’s all sent to our two anaerobic digesters. As the sludge breaks down and stabilizes, it helps to create energy that we use to power the plant. The clarified wastewater, which has now received primary treatment, flows from the primary settling tanks on its way to the next step in the process: secondary treatment. In 2018, LCA removed 27 million gallons of residuals (sludge and scum) from the Lehigh Valley’s wastewater. But the majority of that scum shouldn’t have been there in the first place. Fat, oil and grease (known in water treatment lingo as FOG) should never be sent down the drain. FOG causes clogs — including the massive Fatbergs that have been making the news. One of two sludge pumps at Kline’s Island. To transfer FOG from the scum wells to the anaerobic digesters, treatment plant operators must run two specially designed pumps once a day. The pumps have their work cut out for them: the digesters are a half-mile away — at the other side of Kline’s Island. That means both sludge and FOG must be pumped through two half-mile-long lengths of 6-inch pipe to feed the digesters. FOG has an affinity for iron pipe, and over time the congealed muck sticks to the pipe’s walls. This reduces the working diameter of the pipe. Now the pumps must work harder, and the pressure on the pumps’ plungers — normally 40 psi — gradually increases to about 80-90 psi. All the increased pressure accelerates the wear and tear on the pumps, reducing their lifespan. At times the pressure causes shear pins to break, requiring stops for repairs. Think of it in terms of your own body: when there’s too much bad cholesterol in your diet, it causes artery-clogging plaque. This forces your heart to work harder, increasing your blood pressure and causing a host of other problems. Much of the scum that collects at the top of the digesters is fat, oil and grease – FOG. Over time, the FOG accumulation on the inside of the pipes hardens through a process referred to as “saponification.” That makes it very difficult to remove, so every three months, LCA staff must stop the sludge transfer process for a pipe cleaning. The pipes in the Primary Sludge Pumping Station are disconnected, and the entire mile of pipe (2 x ½) is scrubbed via a high-pressure jet truck. FOG also sticks to the inside of sewer pipes out in the collection system. The resulting blockages — like the Fatbergs referenced earlier — result in sanitary sewer overflows. That means we also need to clean the pipes under the streets. Unfortunately, LCA crews must work in close proximity to the sludge and scum when it comes time to clear the FOG. It’s messy, and stinky, and a health hazard, too — before it’s treated, sludge is a concentrated source of numerous pathogens. But thanks to FOG, our frequent cleaning process is absolutely necessary to keep the pump station working. What can you do to help? Flush only human waste and toilet paper! Did You Know Rainstorms Change the Water Treatment Process?